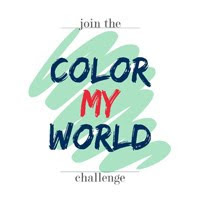 First of all I want to thank Linda of Calling It Home for hosting this amazing event. I've been able to finish 3 rooms thanks to this challenge and I'm looking forward to continuing with other rooms as well. My master bathroom was always very nice but it just needed a little push to make it great. I stenciled the bathtub when we first bought the house. You can see the before here. I'm not sure if I would do it again, but there was no way I was changing it remembering the time and effort I put into it. That was back when the house didn't have air conditioning and it was August. I'm pretty thrilled to have this room DONE and I'm going to try super hard to keep it looking this way. A few things about the room in case anyone is interested. 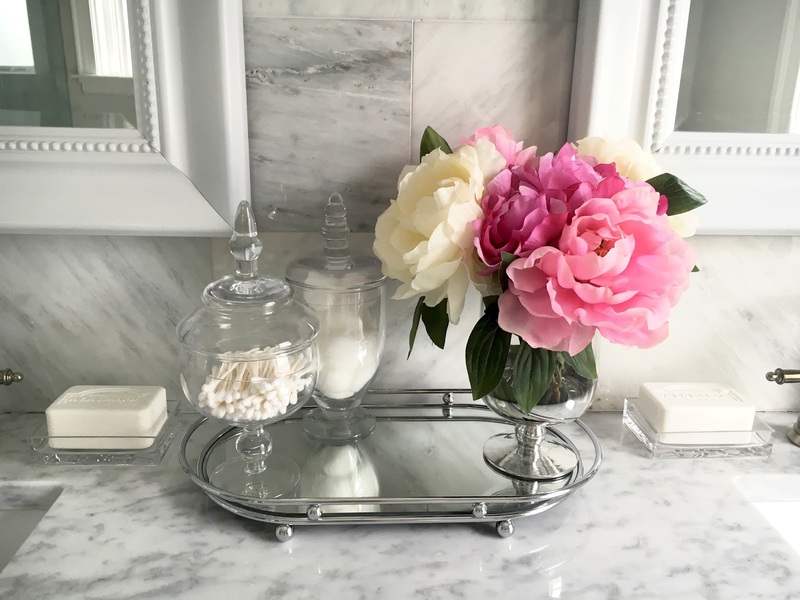 -The apothecary jars were a mix of Pottery Barn and Amazon. Now that this is over I'm so excited to see how everyone else did on their rooms....and I'm already thinking about which room I want to take on next! Check out all the amazing reveals and enjoy! 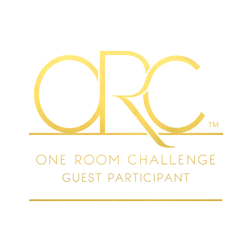 One Room Challenge Guest Participants. It was beautiful before and now it's just next level stunning! Fabulous tweaks Tiffany!! Thanks Jana! It's amazing how the tweaks can make all the difference. 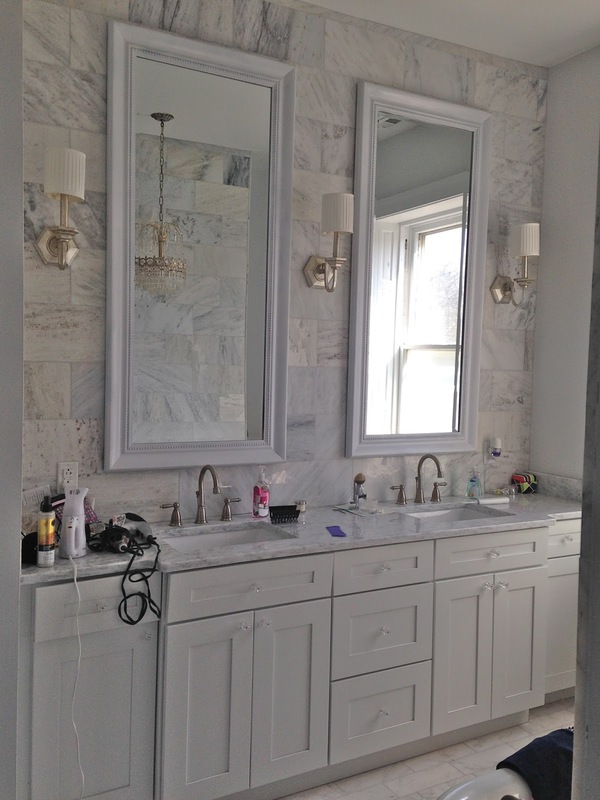 I love the cabinets and sink combo. 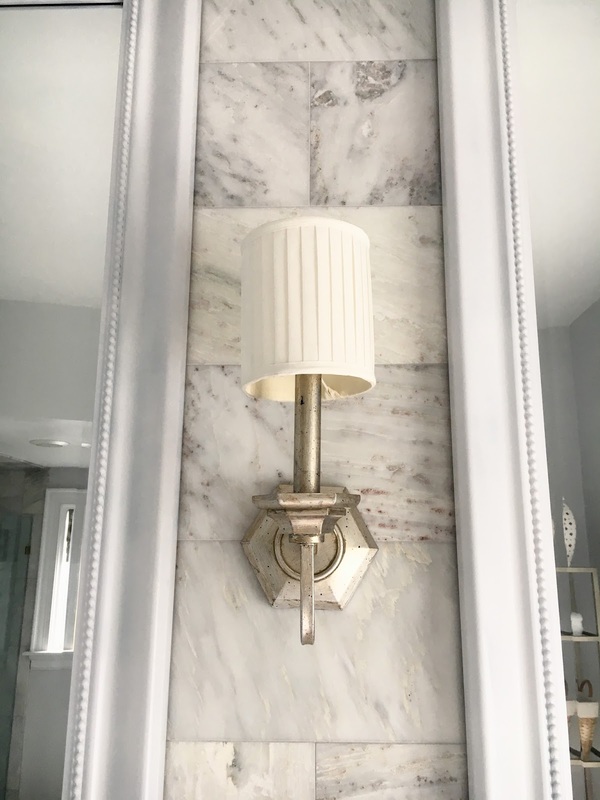 I can't believe you did two rooms as part of the One Room Challenge...I barely got one done :) Your master bathroom is to die for...love that chandelier! Thanks! I've been procrastinating with both rooms for so long. They just needed to be done and this was the extra push I needed. 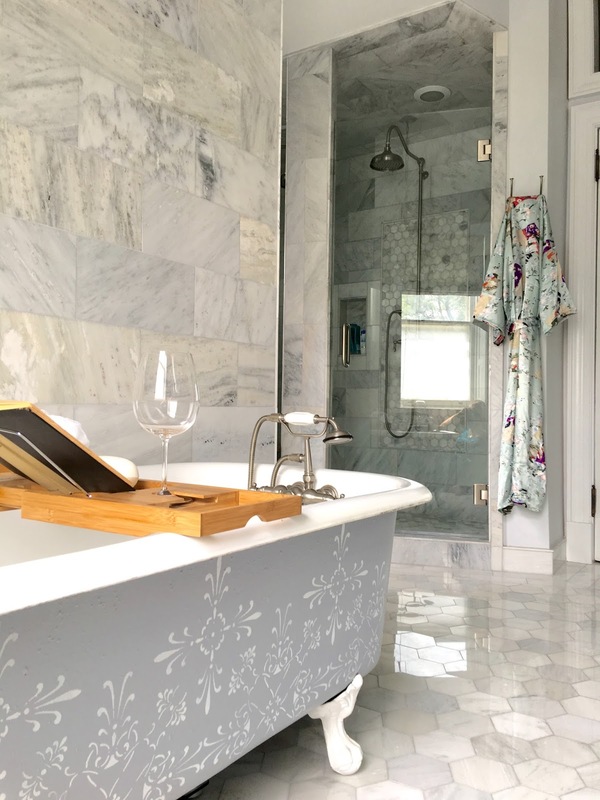 Gorgeous bathroom Tiffany! Everything you did looks so beautiful - great job! Thanks so much! We're thrilled to have it finally finished. What?! 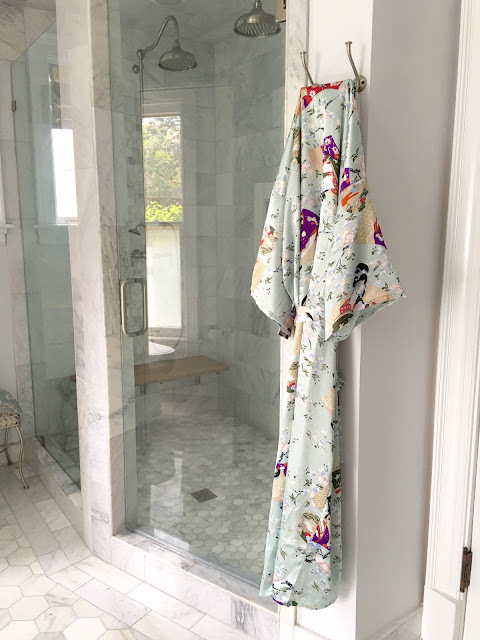 A smashing Sunroom and now bath?! You have been crazy busy Tiffany! 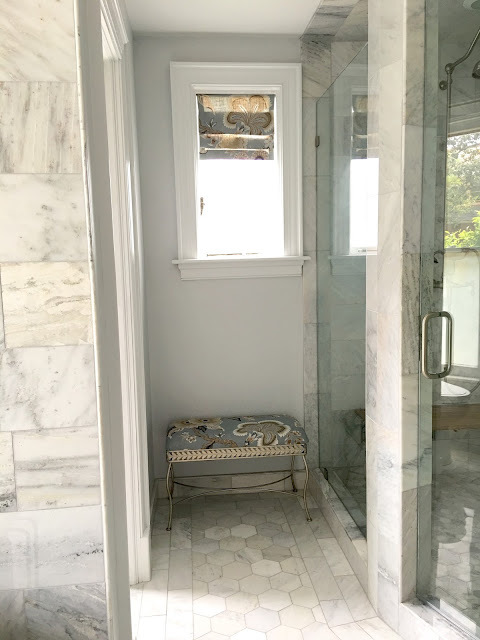 But I absolutely love this bathroom too! The double shower is GENIUS and I love all the marble! Enjoy! 2 rooms at 1 time? OMG....you are awesome!!!! Absolutely gorgeous! 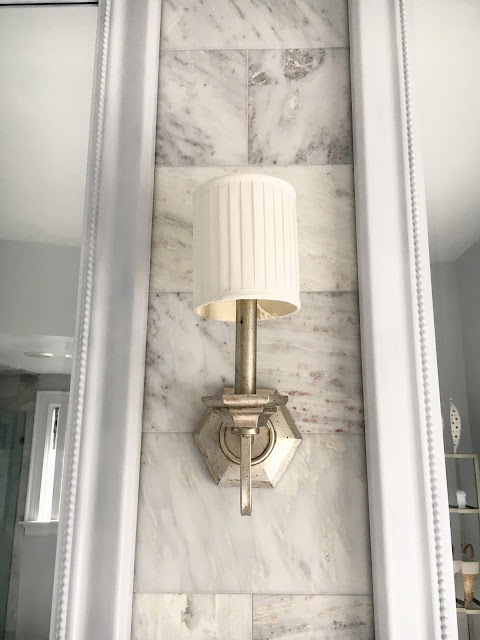 It's so light and bright and elegant! Great job! Tiffany, I stumbled upon you via the ORC, but just realized that I've been on your blog before while looking for reviews of stencils from a certain website. 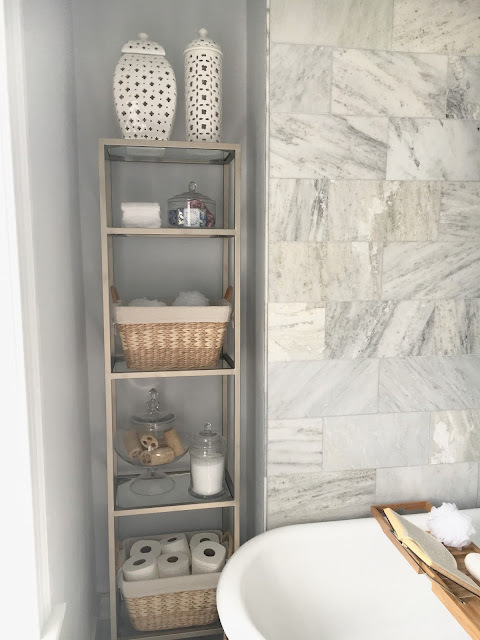 I just read back a few years and am so in love with the work you've done on your home (and your patience as you've updated it)! 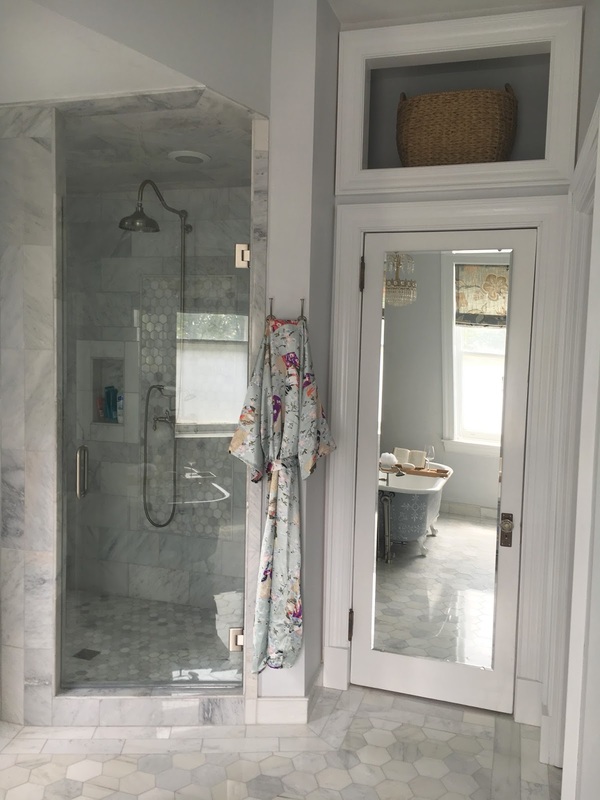 Stunning bathroom!! Gorgeous and so very serene. Beautiful work!! 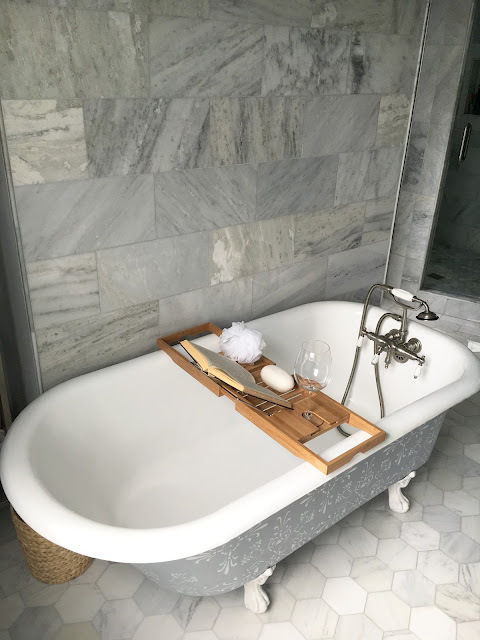 I LOVE those marble tiles!!! 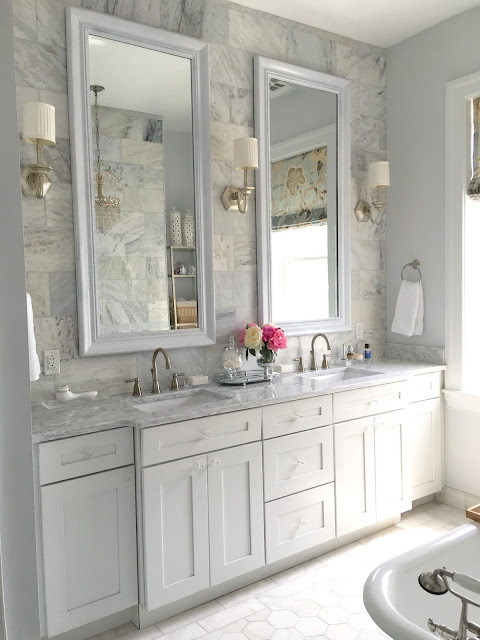 What an absolutely stunning bathroom. 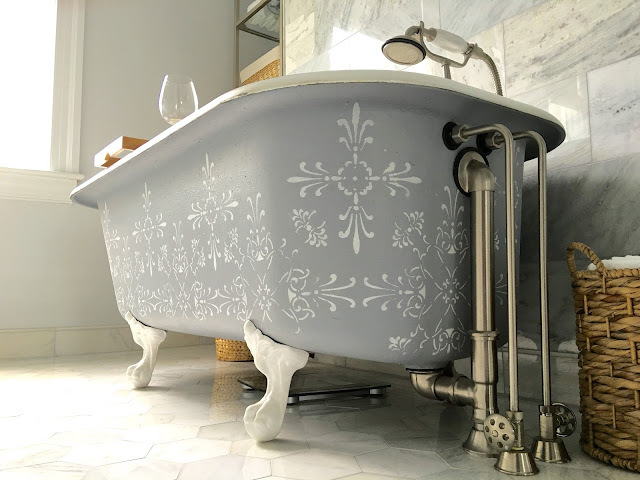 I love the painted design on the tub. Have a wonderful flower filled week. Thanks Laura! It was such a pain to do but it turned out pretty nicely. Yes yes yes to everything! What an amazing space to start your day in. Love everything you've done in here! Thanks Tricia! We couldn't be happier with how it turned out. What an absolutely stunning master bathroom Tiffany! Just gorgeous!!!! That tub is awesome. Love the color and the stencil. Fantastic job! 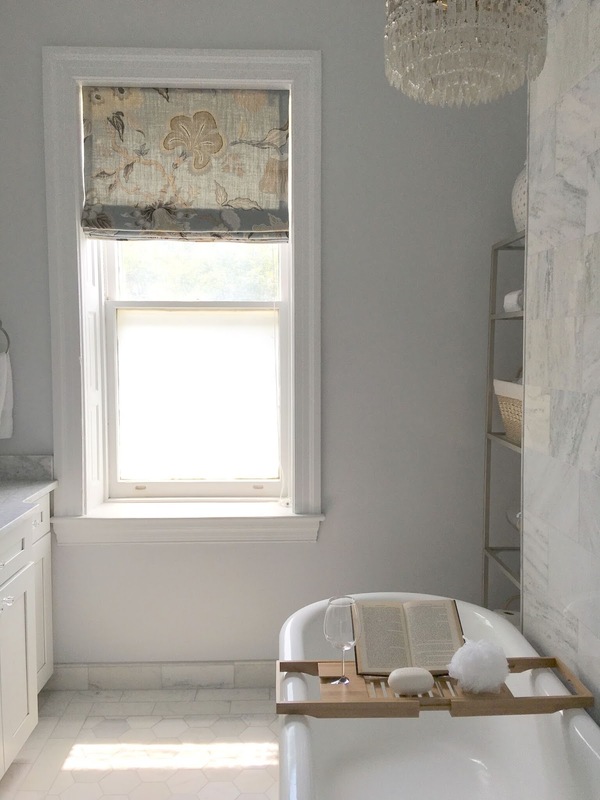 And now I covet your bathroom chandelier... Beautiful bathroom! 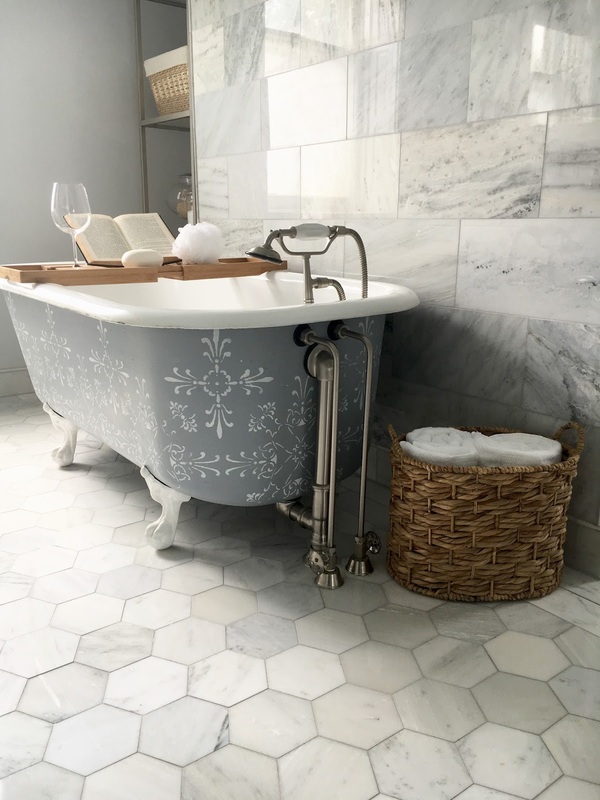 Such a dreamy bathroom. I love everything about it!